Tyria jacobaeae, more commonly known as the Cinnabar Moth, is a brightly coloured arctiid moth, named after the red mineral cinnabar because of the red patches on its predominantly black wings. Cinnabar moths are about 20mm long and have a wingspan of 32 to 42 mm. Cinnabar moths are day-flying insects. 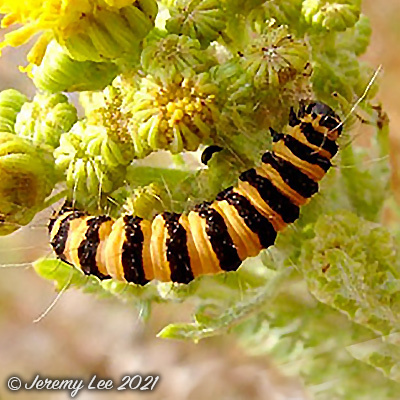 Like many other brightly coloured moths, it is unpalatable; the larvae use members of the genus Senecio as foodplants. Many members of the genus have been recorded as foodplants, but for long-term population success, the presence of the larger species such as ragwort is needed. Smaller plant species, such as groundsel, are sometimes used, but since the species lays its eggs in large batches, survival tends to be reduced. The bright colours of both the larvae and the moths act as warning signs, so they are seldom eaten by predators.